← IHBC’s May ‘Council+’: Ideas bear fruit, as early career members ‘reverse mentor’, generating fresh perspectives on your institute’s future plans and structures! See the ruins of Pompeii like you’ve never seen them before: Through the eyes of a Drone! The better part of two millennia after its entombment in ash and pumice by Mount Vesuvius, Pompeii ranks as one of Italy’s most popular tourist attractions, and now thanks to technology, entirely new views of Pompeii have also opened up. 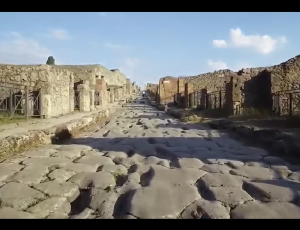 The video… of the post takes a quick flight down one of Pompeii’s streets, which at first looks like nothing more than a faster, smoother version of the experience available to any visitor to the ruined Roman city. But then the perspective changes in a way it can only in a drone-shot video, revealing the sheer scale of Pompeii as does no possible vista from the ground….